The Estetica Institute helps patients look more youthful with a variety of wrinkle fillers. Wrinkle fillers have become increasingly popular over the years to reduce wrinkles, enhance lips and restore volume in the face through small injections. Unlike the injectables, Botox and Dysport, which eliminate wrinkles by temporarily paralyzing the muscle causing the contraction, dermal fillers fill out wrinkles and add volume to areas like the chin, cheek bones and lips. And with a variety of ingredients to choose from, including human-based collagen, bovine-based collagen and fat transfers, the options are endless. Restylane: If you’re looking for something to smooth out wrinkles particularly those around the mouth and nose Restylane is growing in popularity. This FDA-approved, hyaluronic acid-based filler also offers long-lasting results, with treatments lasting up to six months or more. The most common side effects include headache, nausea, redness or pain at the injection site. Perlane: Also a hyaluronic acid-based filler, Perlane is another great option to treat nasolabial folds, frown lines, crow’s feet and lips. Hyaluronic acid is a resilient chemical that easily molds to facial contours and offers longer-lasting results than the once-popular collagen injections. In fact, it can last up to six to eight months and is also beneficial in chin and lip augmentation, filling cheek depressions, softening acne scars and more. Juvederm: This FDA-approved, hyaluronic acid-based filler is perfect for plumping up lips, reshaping cheek contours and filling out deep wrinkles between your cheeks and nose, and between your nose and the outer corners of your mouth. Its pliant gel consistency provides a natural-looking appearance, and its effects can last anywhere from six to nine months. Side effects may include redness, tenderness or pain at the injection site. Juvederm™ Voluma™: is the latest of the Juvederm range of hyaluronic acid fillers specifically designed to restore volume in areas of volume loss. Common areas include the cheeks, cheekbones, and chin. Additionally, due to its versatility it is also suitable for adding definition to the jaw line. As we age, facial fat loss, gravity and loss of the skins natural elasticity conspire to reverse this triangle’s composition, leading to a narrower, less youthful forehead and temple area, and a wider, heavier jaw line. Juvederm™ Voluma™ can restore balance and heart-shaped proportions to the face by subtly adding volume to areas where this is lacking due to the effects of ageing or extreme weight loss. The result is a restoration of the triangle of youth back to its original form resulting in a softer and more youthful appearance. Juvederm™ Voluma™ and carefully placed Botox along the jaw and neck works as a necklift and redefines the triangle of beauty. Juvederm™ Voluma™ can last for up to 18 months, although this can vary from individual to individual. Radiesse: This calcium hydroxylapatite-based filler is biocompatible, non-toxic and non-allergenic. While it’s not recommended around the lips due to its larger particle size, it can be very effective in reducing the appearance of wrinkles, skin folds around the mouth and nose, as well as certain scars. The injection is performed with local anesthesia, and provides up to 80 percent improvement immediately after treatment. Radiesse patients typically enjoy the benefits of this procedure for two years or more. 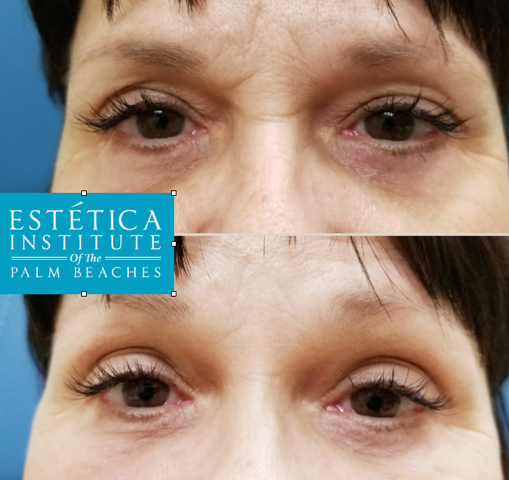 If you’re interested in any of our wrinkle filler procedures, please contact us at Estetica Institute of the Palm Beaches for more information, or to schedule a consultation with one of our doctors.